The membership of the Tennessee County Services Association (TCSA) has elected Ron Berry, a veteran Roane County commissioner, to serve the next year on the board of directors for the National Association of Counties (NACo). Berry, chair of the Roane County legislative body for three years, has been active in NACo’s new High-Performance Leadership Academy, an online 12-week program developed by the Professional Development Academy and offered by NACo to county government officials and professionals. Berry is the only Tennessee participant in the new program, rolled out earlier in 2018. Berry, who has served a total of 13 years as a Roane County commissioner, has been active during his tenure with TCSA and the Tennessee County Commissioners Association (TCCA), currently serving as chair of the TCCA Membership Committee. He is also chair of the TCSA Education Committee. Berry’s service on the NACo board is for one year and is subject to renewal during TCSA’s annual fall conference. NACo board sets the strategic goals, policies and priorities of the association, as well as oversees the association’s policies, business and property. The Tennessee position on the NACo board had been held most recently by former Shelby County Mayor Mark Luttrell, whose tenure as county mayor ended this August when he was term limited. Berry attended Middle Tennessee State University and now attends First Christian Church, Disciples of Christ, and serves as an elder. 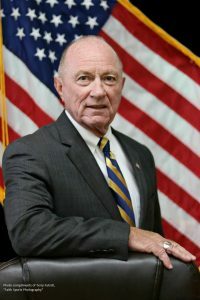 He served 16 years as chair of the Rockwood Water, Gas & Sewer Board, and has served on the Roane County school board and as chair of the Roane County Public Utility Board.